With 47 top class wins (4th most successful winner in all time) it is no surprise that we concluded that Lorenzo is a genuine champion. However looking at the numbers we saw that his reign was far from reaching the heights of the most successful rider in the top class of Grand Prix racing: Valentino Rossi. We compared Lorenzo’s reign (47 victories in 11 years) with Rossi’s first 11 years and we saw how Rossi clearly outperformed Lorenzo – or any other human being (including aliens), for that matter – with 79 victories in 11 years since his first victory. Rossi arrived to the premier class in 2000, the year after Doohan injury-triggered retirement, which left a vacuum that was contested by riders like Criville (15 victories during his career), Biaggi (13 victories), Capirossi (9 victories), Barros (7 victories), or Okada (4 victories). And while these riders were extremely skilled (every single rider in MotoGP is extremely skilled in my view, including the ones who pay to be there), their numbers say that they were far less successful than the inch-perfect riders that Lorenzo found when he arrived to the premier class. When Lorenzo landed in MotoGP, he had to compete against 4 of the most succesful riders in history: Rossi (89 wins during his still ongoing reign), Marquez (40 wins), Stoner (38), and Pedrosa (31). So surely, while Rossi-Biaggi fights were visceral and intense, the level of the riders that filled the grid alongside Rossi was probably a bit lower (at least it was considerably less successful) than the riders that Lorenzo faced since 2008. So what if we forget about the early years of Rossi, and we look at the victories of all riders since 2008 only? And boom! here you see why Lorenzo sees himself as a true champion. Since he entered MotoGP, he has won more races than anyone else, including Rossi (whom he beat regularly on equal machines), Stoner, Pedrosa, and Marquez. 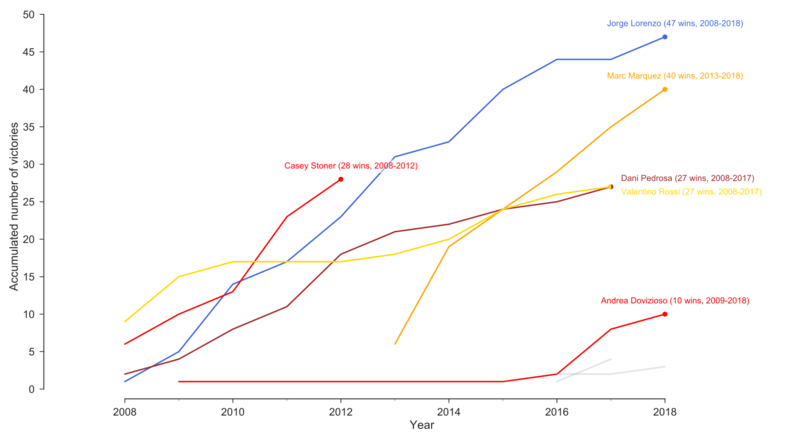 Yes Marquez has accumulated 40 victories in 6 years, only 7 less than Lorenzo in 11 years, but if we look at the graph above, we can see that the only rider to keep pace with Marquez during 2013, 2015, and 2016 was Lorenzo. Keeping the new poster boy at bay until Lorenzo moved to Ducati in 2017. So in short, Rossi might have had a much longer and successful MotoGP career than any other rider, but nobody has matched Lorenzo – not even Rossi – since Lorenzo arrived to MotoGP. No wonder why Lorenzo sees himself as the true champion that he is. Next PostNext Comparing the incomparable.